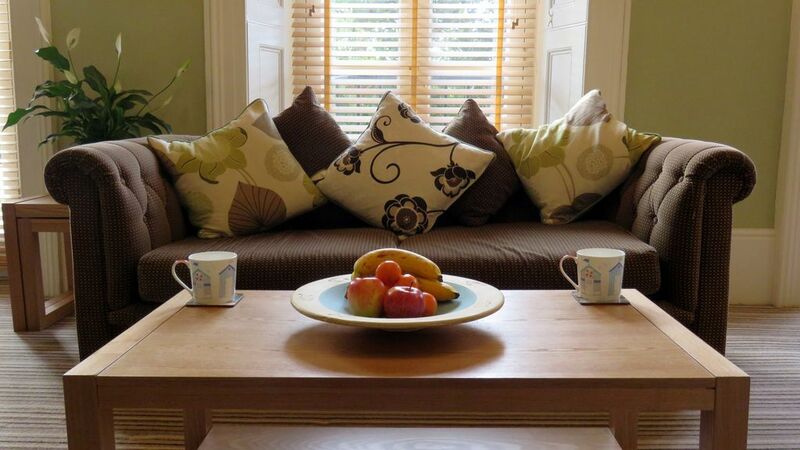 ExeterSelfCatering is a highly rated, ground floor apartment comprising a large open plan living/dining and fully equipped kitchen area with two double bedrooms, two bathrooms, a private car park and fast internet. The apartment is independently owned and managed - we'll personally greet you and can be contacted if needed. The apartment forms part of a historic Georgian building, where the period features are complemented by modern comforts, including full double glazing and gas central heating throughout. Situated in a very quiet area of central Exeter, a short walk from the city centre, the apartment is located on Clifton Hill, a leafy Georgian terrace next to Belmont Park. On entry there is a spacious hallway with cloakroom and access to all of the rooms. The very large 8m x 4m living/dining room allows enjoyment of the high ceilings, together with three fully double-glazed, south facing sets of doors and Juliet balconies, making the space bright, light and airy and overlooking the shared gardens. The living area is furnished with two three seater sofas, coffee tables and equipped with a 50” Samsung Smart TV, sound system, Blu-Ray player and Bluetooth connection for your personal devices. The dining area is equipped with a table and seating for six, enabling you to entertain, using the extremely well equipped kitchen. The contemporary kitchen, with granite worktops, is equipped primarily with Bosch appliances – an induction hob, multi-function oven, microwave, fridge/freezer, dishwasher, washing machine and tumble drier. There are a range of small appliances such as a toaster, together with various ways of making tea and coffee, and even a Nutribullet. There is an extensive selection of cookware, utensils, china and glassware. A good night’s sleep should be guaranteed as both double bedrooms are at the rear of the building and come with luxurious hotel quality, superking beds (6ft/180cm wide), plenty of pillows, cushions, linen and towels. The superkings can be split into full size singles on request. Anti-allergy duvets and pillows are also available on request. The main bedroom also has a double wardrobe, chest of drawers and a TV. The windows are fitted with the original period shutters. There is a fully tiled en-suite with rainshower, toilet, basin and heated towel rail. The second bedroom also has a double wardrobe/drawer in which there is a hotel safe. The adjacent family bathroom has a full size bath with a shower over and a glass shower screen, toilet and basin. Guests have use of the shared garden and next door is Belmont Park, with a children’s play area. Many places in the counties of Devon, Cornwall, Dorset, Somerset and Wiltshire are within an hour’s travel time, with almost all less than two hours. This includes world class resorts and beaches in Devon & Cornwall and heritage sites such as the Jurassic Coast, Bath and Stonehenge, and many National Trust locations. A car is not needed for your stay - there is a Waitrose supermarket close by, the city centre and Quayside are a short walk - all in all perfected located to explore Exeter. We regularly welcome business and leisure travellers from around the world and hope you will enjoy Exeter as much as we do! We've been involved with the tourism industry, and been avid travellers ourselves, for many years. This gave us an opportunity to provide the sort of accommodation that we like to stay in when we travel - we hope you like it too! Please note we are an established business - fully compliant with national and local laws, tax authorities and carry business insurance for guest letting. We looked for a long time to find a central, but quiet, large two double bedroom apartment with two bathrooms, that also had onsite parking. Not an easy brief, but one we now know is appreciated by the hundreds of guests that have stayed and made kind comments. Easy access to River Exe and canal. Two three seater sofas, very spacious, 3 double door juliet balconies. Tea and coffee for your length of stay, and a welcome pack. Fully equipped including washing machine and tumble drier. A selection of family games. Shared garden for the building opposite. Belmont Park 100 metres away, with children's playground. 3 double door juliet balconies in the living room. Available for hire at Exeter Quay - 20 mins walk. Golf driving range 100 metres. The apartment is on ground floor level. All rooms are accessible without steps, except for the second bathroom, which has one step. There are a few steps up to the front door of the apartment block. Please ask for a copy of our Access Statement. Very comfortable apartment - easy walk into the Town Centre and Waitrose is just a short walk away - never regretted not having a car. Kitchen is more than fully equipped. Philip was very responsive to our inquiries prior to our visit and an early morning telephone call the day we departed. Lovely touch to have a cream tea waiting for us on our arrival. Wouldn't hesitate to return. As we were there for new year it was lovely that there was a Christmas tree ,chocolates and a little food hamper.Dishwasher and washing machine tablets too. Many thanks to you Phillip and Louise. Many thanks for your kind words. We like to provide an appropriate welcome for special occasions, especially if guests are staying across major holidays. So pleased that you had an enjoyable stay. Beautifully appointed apartment with everything you need for an enjoyable stay. Excellent location within easy walk of the town centre. Fabulous! The apartment was large, well located for walking into Exeter and extremely comfortable. The living room is large with comfortable furniture, a beautiful smart TV and a fully equipt kitchen. We were very grateful for the milk, scones, hot cross buns and bananas left for us and the kitchen has everything you need including washing up liquid, dishwasher tablets etc. The bedrooms have large, very comfortable beds and the bathrooms are beautiful with an excellent shower in the en suite. Loved the big bath towels too! Philip met us on arrival and was very helpful. Thank you for everything. If you are looking for an Exeter property for any length of stay, you do not need to look any further than this one. We will definitely be back. Many thanks for your kind comments. We look forward to the opportunity of welcoming you on a return visit to Exeter. The apartment is very well equipped to a high standard, comfortable, clean, quiet and convenient. Hope to come back! An excellent apartment. Superbly equipped and spacious. Well located, central Exeter within walking distance, as well as a good size Waitrose nearby. So pleased to hear that you enjoyed Christmas at our apartment. We look forward to welcoming you back in the future. Walking distance to the city centre, in a quiet residential area. Next to Belmont Park, golf driving range and dry ski slope.